This was truly the perfect getaway. The view was amazing and so was the cabin. We look forward to coming back soon!!! Thank you for all of the great memories. What a beautiful cabin! Gorgeous views! Perfect location! Hands down, the nicest cabin we've stayed in and the best equipped. Loved the gazebo and all the rocking chairs. Thank you for sharing your wonderful ridged retreat. Loved the countryside! What a wonderful getaway. The cabin is beautiful and the scenery is spectacular. David and I had a really great time. Thank you so much! Thank you very much for sharing this wonderful spot in the Smokey's! We loved it. My family loves this piece of the world and come here every year to enjoy a new spot. It was hard not to add to the collection of bears. We had a totally relaxing and enjoyable experience here. Love the hot tub, the view and the peaceful nights at this cabin. We went to Cherokee and another day we went White Water Rafting. We loved the town of Bryson City. IT was so close to the places that we explored. Another great weekend spent here for our anniversary (#30). Great time and love this cabin we will see you next year. So nice to get a call when we arrived! What a wonderful place to call home during our vacation. Everything exceeded our expectations, and we especially appreciated having all of the brochures and area info at the cabin. Friendly and efficient check-in. Adding a few days to our stay was as simple as a 30 second phone call. Very well run office. Loved staying here. Beautifully furnished, clean and new cabin. Nice, quiet setting close to everything we wanted to visit. Great mountain views. Enjoyed our evenings on the deck watching the numerous hummingbirds visiting the feeders. They were able to find me a great cabin with very short notice. Easy to work with; the whole rental process went smooth. Cabin owners seem to have thought of every detail needed for a great family vacation - from the family games, popcorn popper, great books, well stocked kitchen items - we had everything we needed for a great week. Cathy was very nice and very helpful. The staff I talked with on the phone were friendly and pleasant. They were helpful. We took an extended trip and visited a total of 4 different locations. This cabin was the nicest and it also had things that we would need provided for us. Another cabin that we rented didn't provide anything compared to your company. That was a nice gesture of yours to make sure that things like bath tissue and other necessary amenities are there for your renters. It provides for a much better representation for your company. I would love to stay with your company again and I will not hesitate to recommend you to others. Everyone I have spoken with or emailed with have been wonderful. We love this cabin! Beds are wonderful, kitchen is awesome to cook in - the first time was last Thanksgiving - we cooked our entire meal there turkey and all, for just two of us. 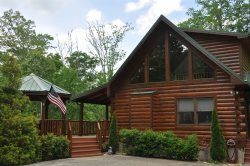 We previously stayed with Great Smokys Cabin Rentals, they seem to have the best - homey - newer cabins. We enjoy visiting the surrounding towns, and basking in the different streetscapes along with a little shopping, some great food, we also enjoy the drives from place to place taking in the scenery.